The study of the New Testament gained pace at the time of the Reformation. Protestants, following Martin Luther, demanded that the Bible be translated into local languages - but the question soon arose as to which Bible should be translated - which books and which parts of which books? In which order? For example, Luther's German translation of 1534 followed quite a different order to the Latin Bibles of the time. Initially, Luther disapproved of Esther, Hebrews, James, Jude and Revelation. He referred to James as "an epistle of straw," perhaps because James taught that works or actions mattered more than faith or sacrament – quite the opposite of what Luther himself taught – and he argued that the epistle was late and unreliable. He said of the book of Revelation that he could "in no way detect that the Holy Spirit produced it." Luther placed James and Revelation, along with Hebrews and the book of Jude at the end of his New Testament explaining that what came before them are "the true and certain chief books of the New Testament" but that "the four which follow have from ancient times had a different reputation." Although Luther was keen that people read the Bible for themselves, he was not insensitive to the theological problems that this was likely to cause if they were not given guidance. The process of producing translations threw up a host of additional questions. Which text should be used as the basis of translation(s)? Should translations be based on the standard Latin translation, known as the Vulgate, or on the older Greek text, the Septuagint? Should the original Hebrew text be used for the Old Testament? If so, which manuscript? What about individual manuscripts of New Testament books which differed from the Septuagint? How should translations indicate the existence of passages which appeared in only some texts, words which differed between versions or possible alternative translations? The business of translating the Bible was extremely difficult and controversial. Things moved on from single scholars producing a whole translation pretty much by themselves; soon teams of the most able scholars were assembled and worked for decades to produce better versions of the text. 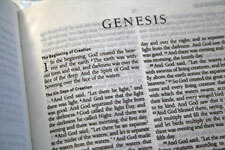 Nevertheless, there has not been a definitive translation into any language and, although the Bible is already available in languages in which 98 per cent of the world's population is fluent (some 2,400 different languages), the United Bible Society is currently assisting 600 different Bible translation projects. • NIV 1 In the beginning was the Word, and the Word was with God, and the Word was God. 2 He was with God in the beginning. 3 Through him all things were made; without him nothing was made that has been made. • YLT 1 In the beginning was the Word, and the Word was with God, and the Word was God; 2 this one was in the beginning with God; 3 all things through him did happen, and without him happened not even one thing that hath happened. • GNB 1 In the beginning the Word already existed; the Word was with God, and the Word was God. 2 From the very beginning the Word was with God. 3 Through him God made all things; not one thing in all creation was made without him. • CEB 1 In the beginning was the Word and the Word was with God and the Word was God. 2 The Word was with God in the beginning. 3 Everything came into being through the Word, and without the Word nothing came into being. • NIV 1 In the beginning God created the heavens and the earth. 2 Now the earth was formless and empty, darkness was over the surface of the deep, and the Spirit of God was hovering over the waters. • GNB 1 In the beginning, when God created the universe, 2 the earth was formless and desolate. The raging ocean that covered everything was engulfed in total darkness, and the Spirit of God was moving over the water. Note how the Good News translation, which is often the only version available in churches and schools, is actually the most likely to paraphrase or translate to make the generally accepted sense clear rather than to render the actual words accurately. For the purposes of textual study it is important to choose a translation of the Bible which is recognised as being very accurate. At this level examination boards and universities usually give recommendations, but as a general rule look for NIV or NRSV versions (Catholic schools may prefer the NJB).